The world-class service doesn’t stop when leaving our showroom. At Vista BMW Pompano Beach, we provide a state-of-the-art service center to ensure our guests enjoy top-notch care throughout the life of your vehicle. We are dedicated to our clients. Vista BMW Pompano Beach owes major thanks to Miami, Ft Lauderdale, Boca Raton and Delray Beach BMW owners who know and expect more from their BMW experience. Putting our clients needs first with a true dedication to customer service and hospitality, Vista BMW Pompano Beach continues to lead by example with exemplary sales and customer service year after year. We make the new car shopping process fun, fast and easy. Every client’s needs are different. Some BMW new car buyers prefer to negotiate the entire sales process online, but many value long-term relationships that on which you can count when you need it. Whether you are a first time BMW buyer or ready to take the lead for the BMW Motorsports Race Team, we will cater to all. By providing each client a dedicated Vista BMW Pompano Beach Client Advisor and Sales Advisor, we are able to get to know each client and cater to their needs. 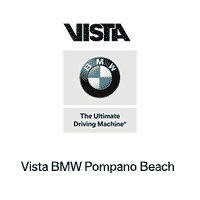 Vista BMW Pompano Beach is an independent, family owned and operated business. Despite our size and sales volume, we have never forgotten from where we came and how we got to where we are today. We are a customer service business through and through. From the moment you step foot into a Vista BMW Pompano Beach sales showroom or service drive, you can expect full attention to your customer service needs. Vista BMW Pompano Beach is a proud member of the community for which it serves. We are a locally owned and operated BMW retailer, and take pride in our South Florida roots. We aren’t some large, impersonal national chain. We are a family-owned local business. We love South Florida and our family will always call it home. And our strong sense of family goes well beyond our staff – we welcome every one of our customers as a family member, too.